Scrappy young Up & Comer award. Super hyped for this one. A friend is coming to my place for the weekend, using some of my gear. We’re both still in the compo though, making separate entries. I’ve been exploring a variety of tech recently, so I’m still unsure about what I’ll use. What ever is best for the job I suppose. Library/Engine: Kha, Luxe or vanilla JS with HTML5. Music: FL Studio most likely. Sfx: Mic, sfxr, audacity, etc. Level editor: An image (red == tile1 etc), tiled or an array in code lol. I was unsure about entering this Ludum Dare, but I’ve introduced LD to another friend, and helping him inspired me enough to make my own entry. I’ve got an idea, and I’ve started on it. I’m actually using the HTML DOM to make it, something I haven’t really done before. I’m even considering using angular, but I’m not sure. My game is a ‘flat’ rubix cube, where you have to shift rows and columns of shapes to get to a certain pattern. It’d be awesome if you played it and gave me some feedback here. I’ve had a blast, and learned a lot about making a complete game with Luxe. I will now sleep Goodluck to all you guys! I’ve got lots of things to do this weekend, but I might be able to make something interesting. Graphics: Photoshop, pyxel edit, camera pictures, or generated in code. Ancient romans have found a time machine and have travelled to the future, where a crazy nature warrior controls the ancient art of beanstalks, drives cars into people, plants mushrooms that slow soldiers, and puts thorns in the middle of their path. Ancient romans have archers though! And, and soldiers! Surely they will win! My game was made with the awesome Haxeflixel library, and I had a lot of fun. I’ve made a timelapse of this weekend, and will do a post mortem after I have played some of your games! Have fun! Ha! You were not expecting that, were you! Well, it’s really just “I am in” with Base64 encoding. I can probably stop there. 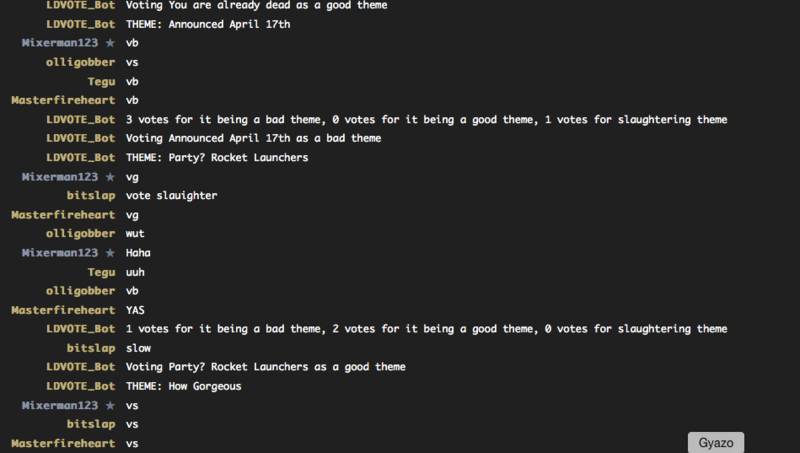 Ludum Dare Voting, IRC channel. So some of you who hang out on the #ludumdare channel often may know that during LD32 I made a little channel where people can vote together. It’s ran through a bot that counts up everyone’s votes and then votes. It’s a little silly because it only counts as one vote, but it is still cool and a fair few of you had some fun last time. I’m making the simple script publicly available so anyone can run it. I’m hoping that if someone is interested in it they will keep it running and a few of you can have a bit of fun. The script is a bot ran through node js, you will need a few libraries, as well as python, to get it running. Look at the docs for the individual libraries for help. This LD I tried using the language I used for the Mini LD, which was haxe with the library haxeflixel. This was risky as using something like unity allowed me better secuirity that I wouldn’t run into trouble, because of it’s huge community. I took the risk of not using it, and it fortunatly didn’t give me any trouble. I didn’t run into any major coding halts, except for one, which I solved with a messy code hack. On the art side, I again used the program Pyxel edit. This is a great program, and let me easily to tiles, animations, etc all in one powerful app. Music I cobbled togethor quickly (again!!) as I just never have time for it. Outside LD I am busy programming, not making music, so again, I just ran autotracker.py. This generated some okay tunes after 30 runs, and I am happy with that. I used sfxr for sound effects and that went fine as usual. I was looking forward to both the theme ‘companion’ and the chosen theme, so I was happy when it was revealed. I had a few ideas, but most seemed like they were fairly standard. Some were altering terrain as a weapon, using sound as a weapon, using light as a weapon, and a few others. I chose “clone” as the weapon though, as I felt like it allowed a lot of freedom, as well as being something I could actully make in 48 hours. I decided the “original” would be a walking bomb, and that you could shoot your clones of to blow up your enemies. This was fine, but then by introducing chaining of explosions, the game had new depth. Now, if there was a row of tnt and one went of, whoever was on the other side of the chain was going to be blown up too! So now, if you spam shot your enemies, you were more likely to die than if you used strategy. This was unexpected balencing, and I think it worked well. On a different note, I had so much fine while working through this. I talked in IRC, that is always a friendly place to talk to like minded game developers. I took a timelapse, which is yet to be uploaded. The pictures taken adds up to around a gigabyte of photos, so it will take a while to turn it into a video. I might post that here if I remember. Crash Bomb is a game about using clones of your original bomb to blow your enemies to bits, and hopefully not yourself in the process. By shoot clones, they bounce around until they hit tnt or an enemy.The levels are filled with TNT though, some of which the enemies place down, so avoid them, or your explosions may end up killing the original! Just saying, some of your games have been incredible, well done everyone. Thats about what I have so far. Not entirely happy with terrain tiles, but they do for now. Also, not sure how you will control/place your clones. At the moment, clicking is just temporary. What were you guys thinking when you put themes in! I got these from my #LDVOTE irc channel. Check it out. VG to say the theme is good, VB to says it’s bad, and VS to vote to slaughter it. Bot tallies up votes every 15 seconds. Join the #LDVote IRC channel to vote together! I made a bot that allows ludlum darers to go on an IRC channel and vote togethor! Every 20 seconds it gives you a theme, and you vote by saying vg ( or ‘vote good’), vb ( or ‘vote bad’ ) and vs (‘vote slaughter’). Join #LDVote on the irc server irc.afternet.org. Warning: I have a real life, so bot is not on 24/7. I will try to run it as much as possible. The user ‘LDVOTE_Bot’ will be online if the bot is active. Yet another I am in post. I will either be using Haxe, with the amazing library haxeflixel, or, maybe, Unity. Probably Haxe, I learn a lot more programming wise, unity feels like it is just a bunch of code that looks like spaghetti with all it’s coupled code. If I spent time with Unity, I could probably get around that, but just using code with Haxe gives me as much freedom as I’d like. Music: Autotracker or sunvox. I never get enough time for sunvox. Sound FX: SFXR, or derivatives. etc etc. Anyone actually read these posts?